The newest Toyota recall affects nearly 50,000 Sequoia SUVs from the 2003 model year and the problem lies in the Vehicle Stability Control system. The Sequoia issue, which was originally identified in Fall 2003, is an overzealous VSC system that will unnecessarily activate at low speeds of around 9 mph. The VSC system will slow the Sequoia down for a few seconds after accelerating from a standstill, leaving drivers with the impression that the Sequoia does not accelerate as quickly as it should. To fix the problem, Toyota will upgrade the program logic in the VSC system. 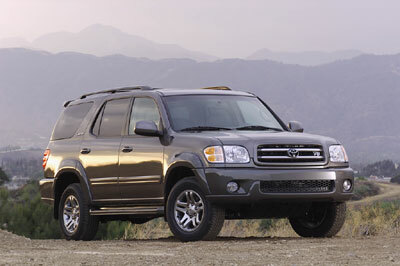 The VSC issue only affects early-2003 models as Toyota ended up addressing the issue in production later that year. Toyota estimates that nearly half of the impacted Sequoias have already had their Skid Control ECU replaced under warranty at some point but is recalling them nonetheless. Sequoia owners who paid for a Skid Control ECU replacement are eligible for reimbursement through submission of the repair order. Affected owners may contact the Toyota Customer Experience Center at 800-331-4331. Earlier this month, the 2010 Lexus GX 460 was also recalled to update the VSC software. In contrast to the Sequoia, however, the GX 460’s VSC did not react quickly enough when the luxury SUV was pushed to its limit in corners.